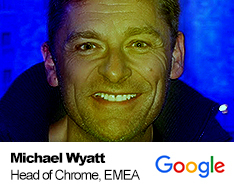 Michael Wyatt has been leading the go to market drive for Android and Chrome in the enterprise for over 3 years at Google. He arrived from a company called Divide which built mobile solutions for the workplace where he built the sales function across Europe. Mike has been running sales and teams that have successfully brought new, and grown existing technologies for over 25 years spanning Cloud Solutions, PC’s, Networking, Software, Apps, Mobile Devices and Solutions, He has successfully started and sold 2 IT companies. He has worked and run sales and got to market teams for companies such as Ingram Micro, Microsoft and Nokia. Mike is passionate about new technology and the benefits new solutions can bring to clients and individuals.